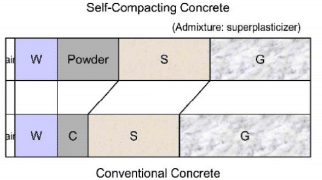 What is the Difference between Self Compacting Concrete and Normal Cement Concrete? One of the key differences between the self compacting concrete (SCC) and normal cement concrete (NCC) is the flowability property of SCC by its on weight. Most of the differences shown by SCC is due to this variation of flowability from the normal concrete. Here the differences between SCC and normal concrete in terms of different fresh state properties, mix composition and long term properties are explained in the below section. Following fresh state properties are used to bring difference between SCC and NCC. The superior properties reflected by SCC is due to its better rheology. The internal micro structure is more crack free and of high strength compared to normal concrete. More about rheology is explained by the workability properties. SCC possess higher workability when compared with NCC. This is the property that enables the scc to perform self-compaction. The workability in scc is increased by the addition of superplasticizers. The superplasticizers help to increase the property of fluidity. Fluidity in scc is not obtained due to moisture unlike NCC. Here the chemical principles happening at the micro level of scc results in increasing fluidity. The figure-1 below shoes the rheological properties of NCC and SCC. The variation is shown in terms of plastic viscosity and yield stress. When superplasticisers are added in lower volumes, the yield stress is lowered. This will bring a flowable concrete without segregation issues. Higher amount of superplasticisers will result in high plastic viscosity and the yield stress is lowered. This creates flowable concrete with segregation issues. The Self compacting concrete make use of viscosity modifying agents (VMA) which creates problems when used in normal concrete. The VMA are pseudo polymers that helps in the reduction of aggregate segregation when compared to NCC. Other than the VMA agent, the viscosity of SCC is high as it has a low water to powder ratio compared to NCC. This characteristic of SCC will inhibit the segregation. Bleeding issues observed in SCC is less compared to normal concrete. This advantage of SCC is due to the lower water content and higher amount of fines. Higher binder content i.e. the cement, cement replacers and sand are causes of high fine content. A well-designed SCC mix can be properly handled without the issue of segregation and bleeding. The strength development is similar to that of normal concrete (As per European Guidelines). As per the recommendations, maturity testing is a good way of controlling the strength development in SCC. The plastic settlement is formed in the concrete above the reinforcement in NCC structures. The use of viscosity modifying and increased powdered content in SCC helps to decrease the risk of plastic settlement cracks. Higher flowability and plastic settlement in SCC prevents the occurrence of plastic settlement that is common in NCC. The cracks are ultimately filled with the increase in flowability. As the bleeding issues are less in SCC compared to normal concrete, the evaporation of moisture is controlled. Hence, proper curing of SCC is facilitated thus avoiding the chances of plastic shrinkage and resulted cracks. Cement content in SCC is in highe volume that results in higher creep when compared with normal concrete. One of the major differences in material is the incorporation of superplasticizer in SCC mix which is ignored in normal concrete design. The SCC concrete can be developed with readily available materials. All other materials employed in SCC is similar to that of normal concrete but the difference is in the proportion added. The figure-3 below shows the variation of material constituents in self compacting concrete and normal cement concrete. In the figure above W = Water, C = Cement, G = Gravel, S = Sand, P= Powder (Cement replacements like fly ash, GGBS, silica fumes etc). It is observed that the aggregate content is decreased in SCC mix in order to increase the fraction of binder in the mix. Hence, the mix obtained with be rich with fines content. Normally, the increase in fine content implies the increase in surface area thus increasing the demand for moisture. But in SCC mix, this demand is met by the addition of superplasticizer. The compressive strength developed for SCC and normal concrete for same water-binder ratio are similar. 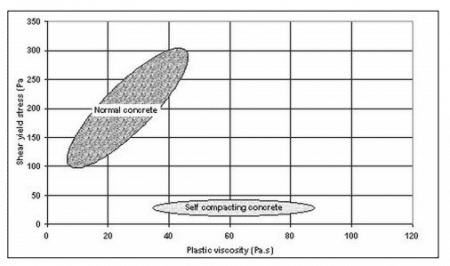 The modulus of elasticity of self compacting concrete is low compared when compared to normal concrete. Older PostHow bridges are built?